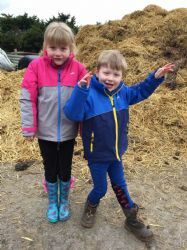 Jollytots Equestrian is a trading name of Kent Equestrian Ltd.
An on-line retailer since 2004, we ventured solely into the sale of riding clothes for toddlers and tots when we found it difficult to buy horsey gear for our daughter, then aged one! With our daughter sorted, we couldn't leave out her mischievous little Shetland pony, Jack, so we thought we had better stock items for cheeky ponies as well! After our little boy came along we ensured that both boys and girls would have no trouble finding their first pair of jodhpurs and joddy boots as we stock plenty of styles for both! We have put together a nice selection of useful equipment and fashionable clothing for your babies, two and four legged!